During the construction of a new production line in 2012, Almeco was closely involved with the development of process cooling. 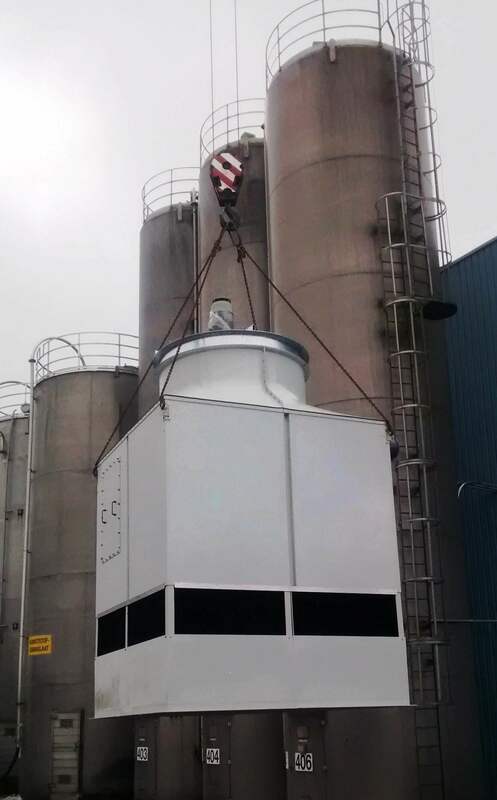 In 2013 we supplied an open cooling tower for cooling 120 m³/hour from 47.9°C to 28.3°C at a wet bulb temperature of 20 °C (discharged cooling capacity 2,734 kW). The product manufactured on this production line has been a success for our customer, so 2016 saw the start of the extension of this production facility. During the summer of 2016 we supplied a second cooling tower with the same properties as supplied in 2013. The cooling tower was supplied in one part so assembly could proceed smoothly. Open counterflow cooling tower with suction axial fan for industrial applications, suitable for cooling industrial process water and fully in line with the best available technology (BAT) and applicable Legionella legislation. The cooling tower is made of self-supporting, glass fibre-reinforced panels. All metal parts are stainless steel (support for the cooling packing, droplet separator and motor bracket). Low-maintenance cooling tower - The cooling tower has a large work opening so inspection and maintenance can be carried out quickly and safely.